Okay, despite news to the contrary, much of which released by yours truly, I will in fact be at Gen Con 51 this year. Now I'm not there yet. 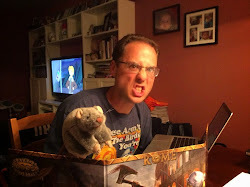 In fact, it's driving me crazy that so many of you are already at Gen Con on Tuesday of Holy Gen Con Week. Ugh! Okay, I can't be upset about this week. Actually, the only reason we're going is because some of our friends really stepped up and helped us make this happen. Plus I have an awesome boss who let me take the last two days of the week off. I owe him lunch. Great dude. But it's so hard watching everyone have fun already in town! But we'll be there soon. Just gotta figure out if we're going to try and make most of the trip tomorrow night (getting into Columbus around 2am, and then Indy the next morning around 10am) or just splitting the trip in half (getting into Indy around noon or 1pm on Thursday). Sometimes this whole "let's live in Philadelphia" thing really screws with our travel. I still haven't figured out how we're getting to Gary Con next year. I'll be spending a lot of time volunteering at the Monte Cook Games event room, helping out with running Numenera and The Strange for my friends in that awesome company. I'm just a fill-in GM, but it's looking like I'll be taking at least two slots on Saturday right now (12-4 and 8pm-12am at the moment). Thursday and Friday night we plan on being at the DCC after hours at Embassy Suites. Chances are that Judge Evie will be GM'ing, and I'll be playing. Saturday night I expect Evie and the gang will be over at the Embassy Suites again, and I'll be linking up with them late. So if you want to hang out super, duper late Saturday... I'm probably in. I may be falling asleep, but I'm in! Since we're staying downtown, it doesn't really matter right? On Sunday day, I have no idea what's going on. I imagine I'll have not spent enough money at this point and I'll be hunting the halls for something... anything... to bring home. We bought a new van a couple months ago (Kia Sedona) so I need to fill that bad boy up. Sunday night I plan on running some after hours Mutant Crawl Classics meets Country Crawl Classics meets Metamorphosis Alpha at our hotel (Omni downtown) or somewhere adjacent. Looking like a full table, but hell, we can probably squeeze in more if Judge Evie assists. And I'm sure that kid will assist! I plan on spending a ton over at the Goodman Games booth, picking up the Gen Con program guide, a bunch of modules, and an extra Mutant Crawl Classics corebook. 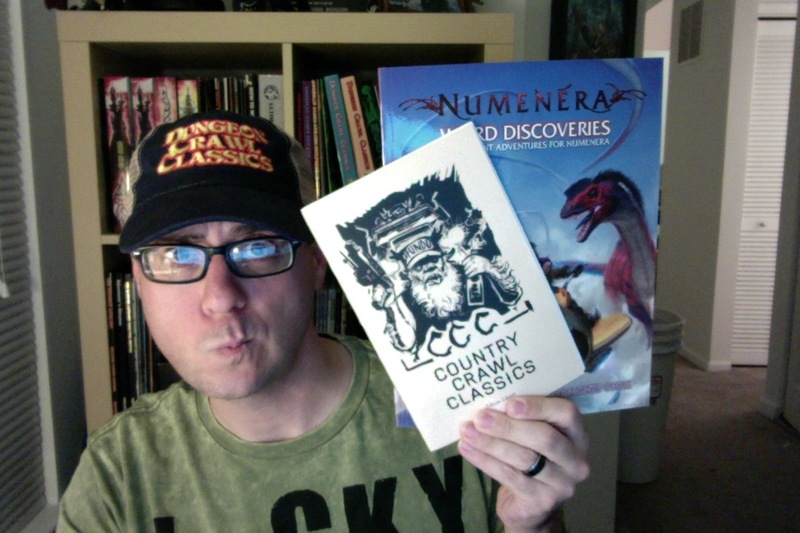 I need another nerd hat that says something other than Dungeon Crawl Classics on the cover, just so I can wear something that isn't branded to another company while hanging out in the Monte Cook Games room. I mean... that's kind of a jerk move, right? I'd like to pick up Numenera - Jade Colossus because it remains as the only Numenera book that I don't own. 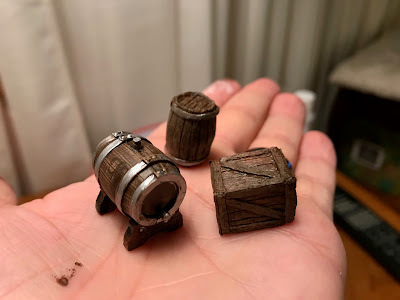 I'd like some awesome miniatures! So that's it. Let's do this, Gen Con! By the way, if you see me at the convention, please say "hi" and give me tons of crap for being quiet on my blog for so long. Given that today's my 28th blog post this month, I think I should get some kind of a pass, but I totally understand if you want to give me crap. I've earned it. But make sure to give me a gentle reminder of who you are in digital space. I know many (most) of you by your static icons, and not by your living, breathing faces. So I may need a bit of prompting. 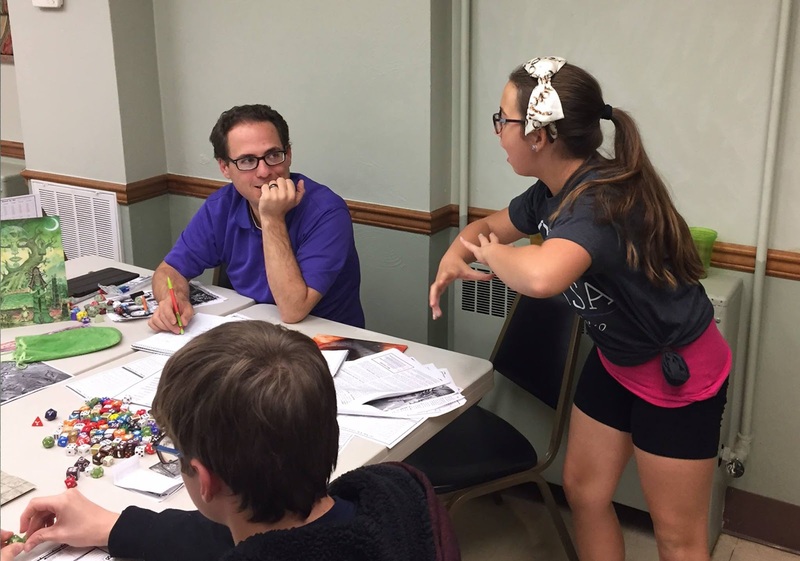 One of the greatest joys of my life has been the opportunity to pass down the role-playing game hobby to the next generation. Whether I'm drafting new game masters at the game club we started in Pittsburgh, or I'm preparing my twelve year old daughter Evie for running after hours events at Gen Con, I love coaching new GM's. Personally, I believe that its the duty of every game master to constantly be looking out for new talent, new storytellers to continue the legends for decades to come. How much prep should I do? How long should the game session be? What if I have a problem player? How do I handle players who aren't having a great time? How do I find new players for my game? Wouldn't it be great if there was a resource out there for these new players? Something more than just a role-playing source book? MCG has your back! My friends over at Monte Cook Games have a new Kickstarter going on right now for what looks like a really fun new project called Your Best Game Ever. This book is going to include a series of articles, tips, tricks, and advice... both for new and experienced gamers... all designed to pack each and every gaming session with as much fun as possible. 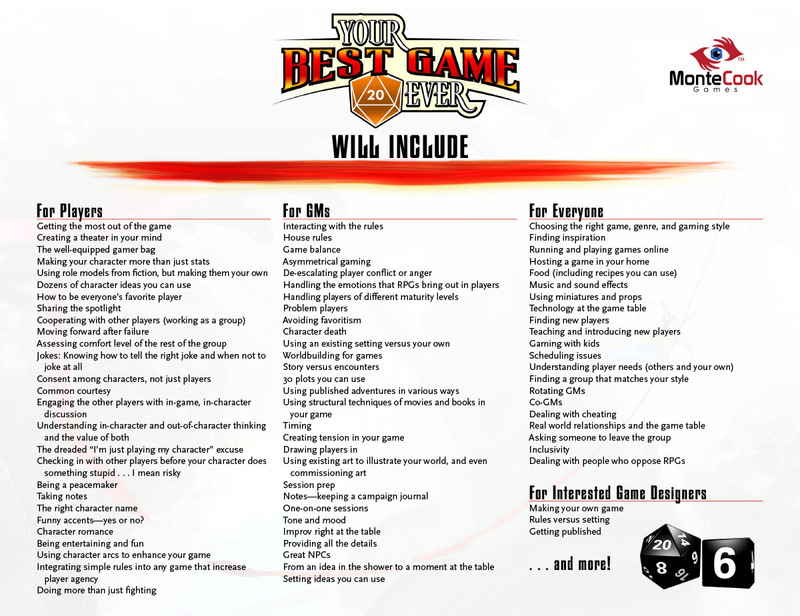 On top of the new resource, the Kickstarter is also going to be funding an update of the Cypher System Rulebook. I've spent the last week going through the Numenera Destiny update, and I'm looking forward to a lot of the tweaks from Numenera 2 showing up in the updated CSR. As an added bonus, it looks like the stretch goals are going to include new Cypher System campaign settings! 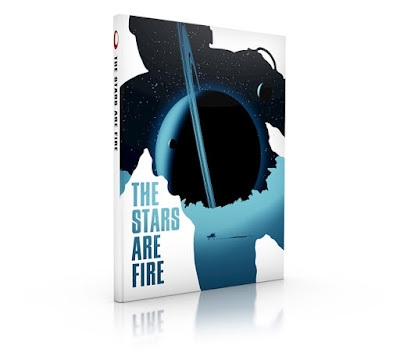 The first add on book, The Stars are Fire, is going to be a hard sci fi campaign setting by Bruce Cordell. I've adored Bruce's work on both The Strange and Gods of the Fall, so I'll always take another of Bruce's campaign settings. Seriously... this GM is all for ALL BRUCE - ALL THE TIME! Anyway, if I've piqued your interest even a little bit, go check out the Kickstarter. Watch the video, give it some consideration, and share some love with Monte Cook Games. I'm proud to be a backer, and I think you will be too. Happy gaming everyone! Hope to see you at Gen Con this week! ... and we are done. At the end of each day, you need to complete the painting of one miniature. It can be any miniature you want, from any game, from any system, from any manufacturer. Partially finished miniatures in your pile are fair game. I figure that this is about finishing miniatures, and working through those pesky figures in your vault. Why not include them? Now, I did have a few that were set aside for later painting, a few that were purchased along the way, and a few that were flat out casualties. Two of the WizKids mages were so frustrating to paint that I just threw them out. For tonight's final miniature, I felt that my last of this challenge should be a "first" from a new company: North Star Military Figures. 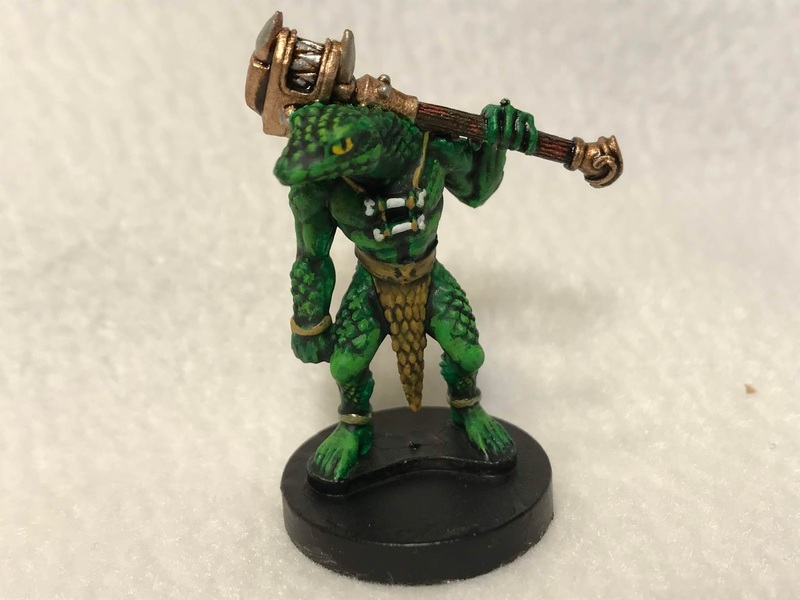 This Snakeman Brute is from the Frostgrave: Ghost Archipelago line, and I have another two dozen just waiting to be painted. The details were amazing, and it was just a couple short nights to make him really pop! I really enjoyed doing the scales. I went with two shades of green, along with a greenish shade/ink, and some yellow, along with an assortment of other colors. But seriously, this was a great time. 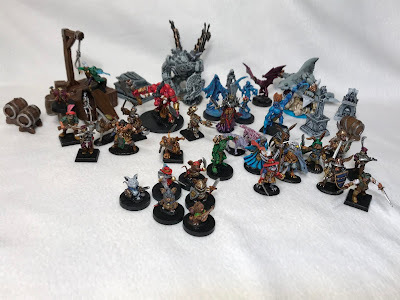 All in all I exceeded my goal of 30 miniatures by 16 for a grand total of 46 miniatures! This Reaper Bones Barbarian, and the Minotaur chasing him, were two of my favorite figures of the bunch. 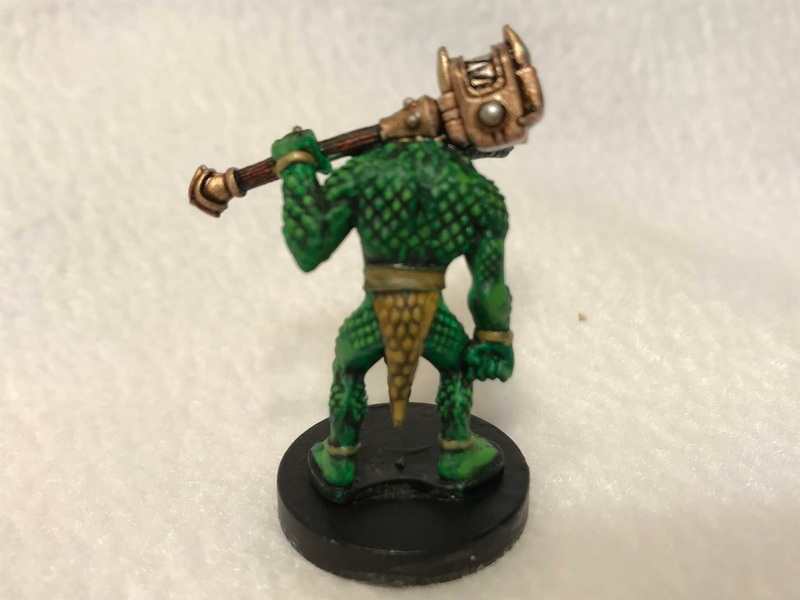 This was my first time painting a Reaper Bones hero and I was not disappointed! 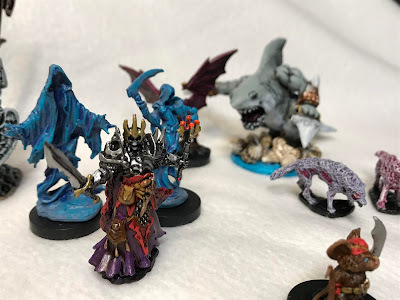 I now have a ton of monsters to add to my collection, as well as a "Lich Lord" for some upcoming Frostgrave gaming. These 6 completed Reaper mouselings wrap up my collection of pewter mice. I've had these Warhammer/Mordheim miniatures form Games Workshop in my collection forever. My only attempt at themed basing. Sure it's just a bunch of seashells on a blue base, but it works for me. First, it knocked out a whole ton of my unpainted collection. But after more miniature shopping, I now have another 50 or so figures that need to be completed, along with a crypt. But that's the thing with miniature painting: we're never truly finished. Second, it got me blogging again. Not just a post every month or so, but seriously blogging. 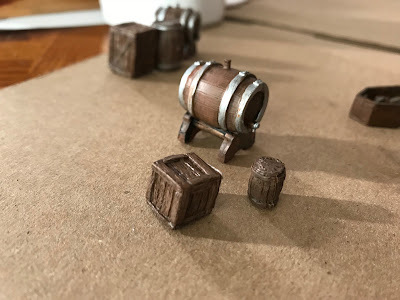 These short posts were fairly easy, and I enjoyed the dialogue with all of you as you took your own journeys towards your #30Days30Miniatures challenges. I'm hoping to keep this up, both the blogging and the painting. Third and finally, it got my mind off of a very tough time in my life. Painting gave me a goal. It gave me peace. It gave me focus. It gave me a sort of "geek zen." I truly hope that all of you continue to enjoy your own miniature painting challenges, whether or not you're on the goal towards completing 30 miniatures, or if you are just looking to knock our one super detailed figure. I can't wait to share more snakemen with you, but I'm taking at least a week off. Besides I need a new brush. I don't even know what my total miniature count is at this point. And can I count lids for sarcophagi and coffins, or are those part of the main piece? What are the rules? Why did I start this challenge in the first place? Enough questions, time to look at this morning's work. Since I am busy planning my #GenCant events, I only painted for about an hour. I finished my second Warhammer Imperial crossbowman, as well as Reaper Bones coffin. Since yinz said you enjoyed yesterday's diorama, I did another today. On the 28th day of #30Days30Miniatures I got around to painting another Warhammer Fantasy mini that's been sitting unpainted in my collection for close to eighteen years. I can't remember who this guy is, or what set he's from, but I remember purchasing him for my Mordheim gaming. So to celebrate, I sent him home and took his "cover shot" right in the City of the Damned! I also painted a small sarcophagus, in honor of that big creepy one that just got unearthed. The tough part about this crossbowman is how tight he's clinging that bow to his chest. Less of an issue with his back though. 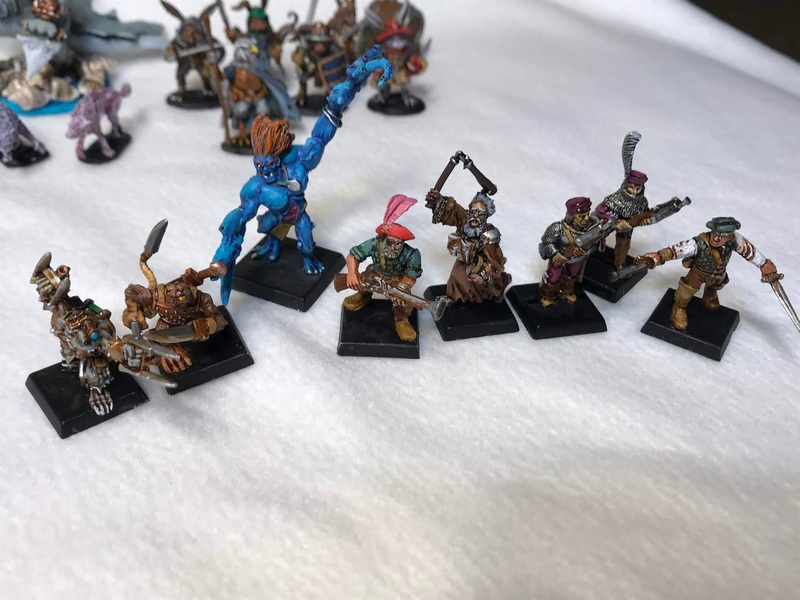 Even though I only finished a couple of these miniatures today, I was also working on the crossbowman's partner, a pumpkin headed dude, a coffin with a skeleton in it, and the very first of my Frostgrave Ghost Archipelago snake men. Also played around more with the Citadel Shades, an still believe that they are way too thin for my taste. In other #30Days30Miniatures news, I can't fit anymore completed miniatures on the first display, so I had to move over to a secondary display. Winning! 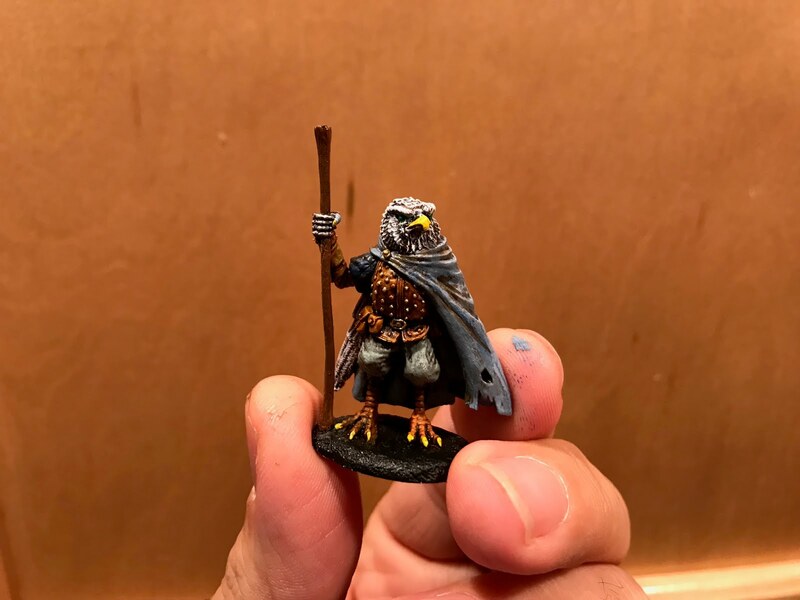 All hail the Bird Wizard! 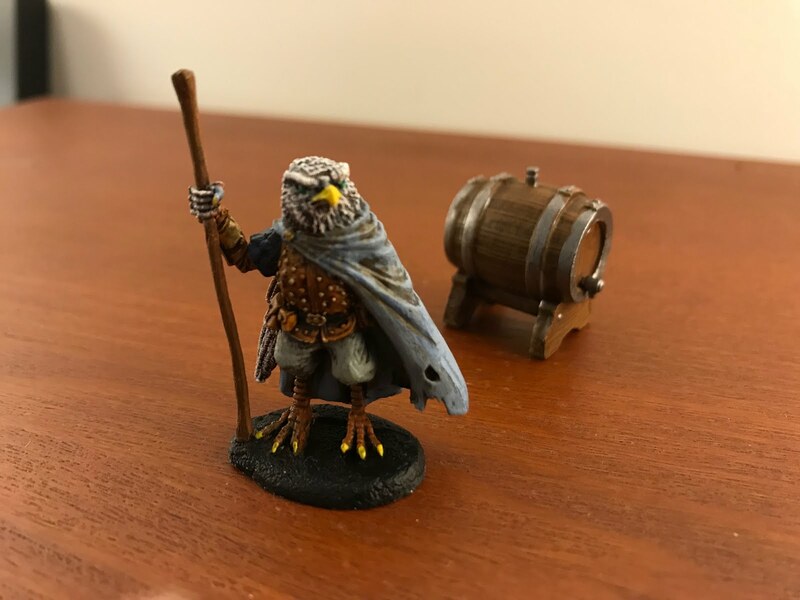 This Dark Sword Miniatures Bird Wizard guy is from the Tony DiTerlizzi collection, and looks absolutely fantastic. Again, my crappy photography just doesn't do him justice. Not quite sure what kind of bird he is, my ornithology is kinda crappy. I also finished another barrel of beer, because its Friday, and that's just how my week is going. Day 27... only four days to go! Just a quick morning painting before heading off to work. More wood. Another day traveling for work, back in good old Pittsburgh! Since my mother-in-law is letting me stay at her house again, I was able to get some painting done while on the road. 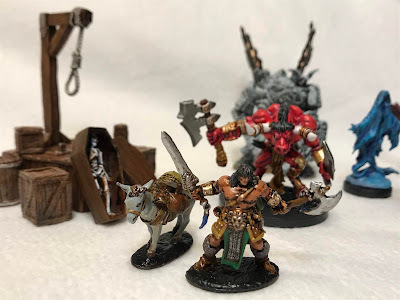 Granted, it's not great painting, and the pictures really don't come out that well, but they are proof of my continued adherence to the #30Day30Miniatures challenge. For tonight's offering, I give you wood. Lots of wood. I finished a beer barrel, a regular barrel, and a box. Tomorrow morning I plan on painting more of the same. Super exciting! This was the first day that the #30Days30Miniatures challenge has felt like a chore. I blame myself, however, for not setting myself up for success. I shouldn't have tried to complete two miniatures yesterday, but instead should've just wrapped up one, got one close to completion, and focused on some of my miniatures that were in process. 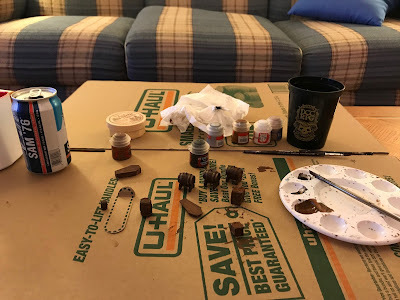 Finding time to paint each evening hasn't been too terribly difficult, but the goal of completing a miniature each night can be a bit of a stretch. To hit my mark, I need to go into each painting session with one of the miniatures already washed, so that I can allow proper time to dry before highlighting. But tonight I had nothing anywhere near that point. So in the middle of painting I took a half hour break, and came back to it afterwards. Painting miniatures became my whole evening. For what its worth, I don't think these pictures do Veskit, Clan Eshin Executioner from Mordheim, proper justice. I was tinkering around with brighter coloring, since most of my Skaven are dark and ominous looking. Why not change things up? Trying something different, I went with one of Games Workshop's newer "shades" instead of the brown or black ink that I typically use for my washes. Wasn't thrilled. I have the sepia shade, and while it looked okay at first, it was just too thin for my taste. I ended up adding some brown ink and trying again. So, adequate finish for a detail heavy skaven. I'm fine with this one. I can live with it. Another couple miniatures completed for the #30Days30Miniatures challenge! 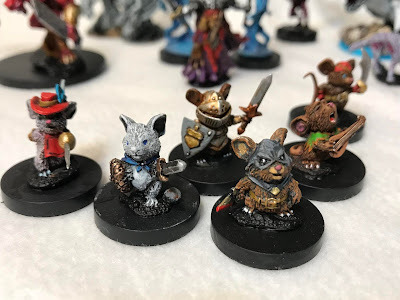 A Reaper Bones skeletal/lich lord and a Reaper (pewter) Mouseling Bard. These mark my 33rd and 34th offerings to date. I didn't plan to wrap up both of these tonight, but I was a lot closer than I expected, so I thought "why not?" The Mouseling Bard was super, super easy to paint, especially since it didn't have any eyes to worry about! I made the last minute decision to add some orange to the edges of the bard's shirt. Glad I did, as it added a fun little tone to what was originally a drab shirt. And what bard could be wearing a drab shirt!? The skeletal lich lord dude was a fun paint as well. He's the main villain who will face off against my barbarian painted last week, at least that's the plan. Lots of red with this one, even on the end of the mace, as I tried to give it a bit of a glowing look. 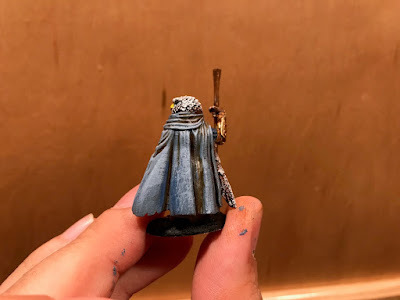 Another fun cloak to paint. As Will would say, you can't get any more METAL than playing Dungeon Crawl Classics at The Games Keep in West Chester, PA. I'd like to further offer that there is no adventure more absolutely gonzo-metal as Sky ov Crimson Flame by Thorin Thompson. 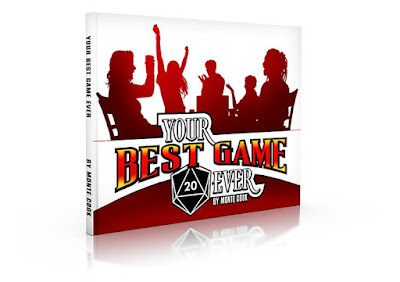 In fact, if you don't own this adventure, and you have an unquenchable thirst to totally jack with your players' psyches from start to finish, you need to purchase this adventure. "I don't even want to find out what that is." If your players are making statements like that, you as a Judge are winning. You are winning hard. Sky ov Crimson Flame lets you win all day. The Art! Stefan Poag, Jordyn Boci, and Nicolo Maioli really knock this out the park. Love Stefan's flying baby-headed bats. Jordyn's cartography is top notch and super evocative. Just wonderful. The Handouts! I love when you get to hand players actual items and artifacts to the game. Thorin does a great job giving judges a lot of stuff to share with their tables. From a love letter connecting one of the PC's to the adventure, to grand scenes of horror, there's a lot here. This is really the closest I've come to writing a review in a long while, but I felt obligated. This adventure is just so, so good. If you love Evil Dead and all its incarnations, this is the adventure for you. If you love horror adventures, this is the adventure for you. If you love Dungeon Crawl Classics, this is the adventure for you. Pretty much, this is the adventure for you. To help connect my players with their characters, I allowed everyone who survived last session to level up their chosen 0-level characters to 1st level. Cody and Evie were both short of characters, so I let them play their choice of character class. We spent the first 30-45 minutes working through character creation, class descriptions, and magic selection. I've only been in a handful of games with one dwarf, so having two was a real treat. Our party was fairly combat heavy too, given the pair of dwarves and a warrior. No thieves, which was a shame. I'm going to let Evie pick one of the Crawl! Zine classes for her next character. She's decided to level up Buena as a Bard. The adventure begins in the village of Reed, located at the edge of the Eastern Forest. In my ever-growing DCC uber-setting, the Eastern Forest is located to the east of the Shudder Mountains, southeast of Frost Fang Mountain, and northeast of the Sunken City and Great City. 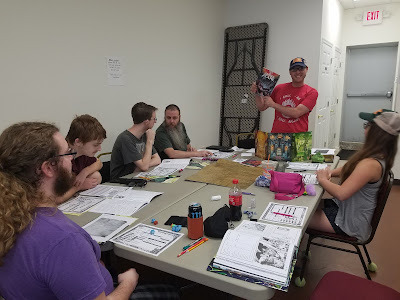 The entire party is a mix of Earth-natives from the last session (Turd Fergeson, Tonya, and Lars) and fantasy world natives (Perrin and Txunamy). Steve James is sort of in a class of his own, as he is the grandfather of Will's former character Steve James III, and is a wizard of some renown in the land. All of Steve James' magic is fish-related. As Rob stated earlier to describe Steve James spellcasting style, "I think what we've learned so far is that there is a fish for every problem." Only two weeks had passed in-game between the inaugural session and this adventure. For those earth natives, they learned the ins and outs of their new classes by montage. Perrin the Dwarf is the lover of Belesa, one of the villagers who had gone missing, thus prompting the adventure. Upon learning of the stolen villagers of Reed, Steve James the Wizard teams up with Perrin the Dwarf to journey east to the Ancient Keep. The party is accompanied by a quartet of commoners driving a wagon heavily laden with supplies. En route to the Ancient Keep, the party is beset upon by crazy, raving villagers. One of these villagers, Biff, was friends with Txunamy. The Elf was horrified when her dear friend was slain, but there was no apparent way to save him. Approaching the Ancient Keep, the party found a pair of crucified villagers being devoured by fat bats. When attacked by the flying creatures, the party saw that they were not bats, but instead they were human heads with bat wings capable of going super-stabby with their dangling spinal cords. Eww! After crossing the stone bridge to the Ancient Keep, the party took the path to the right of the keep to sneak into the structure from the side. The party's two dwarves found a hidden entrance to the side of the keep's basement. In this crypt the party recovered the powerful enchanted long sword "Silvallum." This lawful blade rejected the party's chaotic and neutral adventurers, but found Perrin's strong and courageous dwarven hand as its new home. Moving on, the party found the keep's ancient library. Not the best room for Perrin or Txunamy. While searching a box, Turd Fergeson found the face of Belesa, and when Perrin saw it he went mad! Txunamy found an ancient scroll, but after opening it the words turned the poor elf into a desiccated mummy. I should note that Evie's second character, Buena the Mendicant, tried handling the scroll as well. 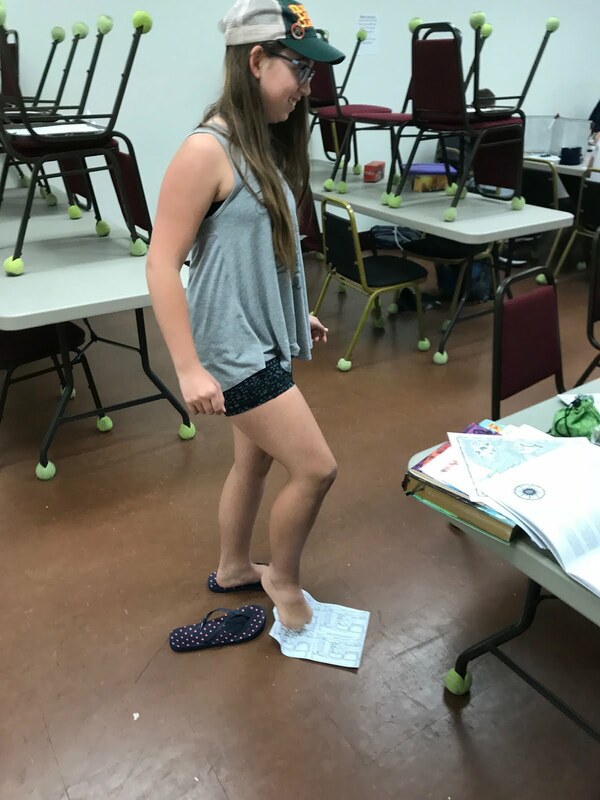 After she described handling the scroll with her toes, I made her reenact the scene with her actual feet. It was amusing. Peaking into the bedchamber below the Keep, the party saw a weird shuffling mass of flesh that was the size of a man. Nope. Tonya pushed one of the book shelves in front of the door, cutting it off from the library. The party also initially "noped" the balcony that led outside from the library, even though there was access to another level by scaling the side of the building. Wanting to explore a bit more, the party headed into the lowest level of the keep, coming across a series of prison cells. It was here that they found the tongueless locksmith Bartholomew. Bartholomew didn't remember much of his capture, but after Turd Fergeson healed his mouth, he was able to share a few details. Eventually the party decided to battle the shambling flesh husk in the Keep's bed chamber. Between the cleaving might of Tonya and Perrin (along with a little fish magic from Steve James) the fight was fairly one sided. Weary of Amon-Tor not answering his prayers, the Cleric Turd Fergeson seemed ready to give up his faith for another deity... or perhaps another profession? Turd Fergeson had possession of Belesa's face and scalp, but after careful examination, prayer, and meditation, knew that the soul of Belesa still existed somewhere on the Prime Material Plane. Perhaps there was still a way to save Perrin's lost love? Txunamy the Elf, slain by reading the wrong scroll, instantly becoming mummified. We shall be continuing Sky ov Crimson Flame! 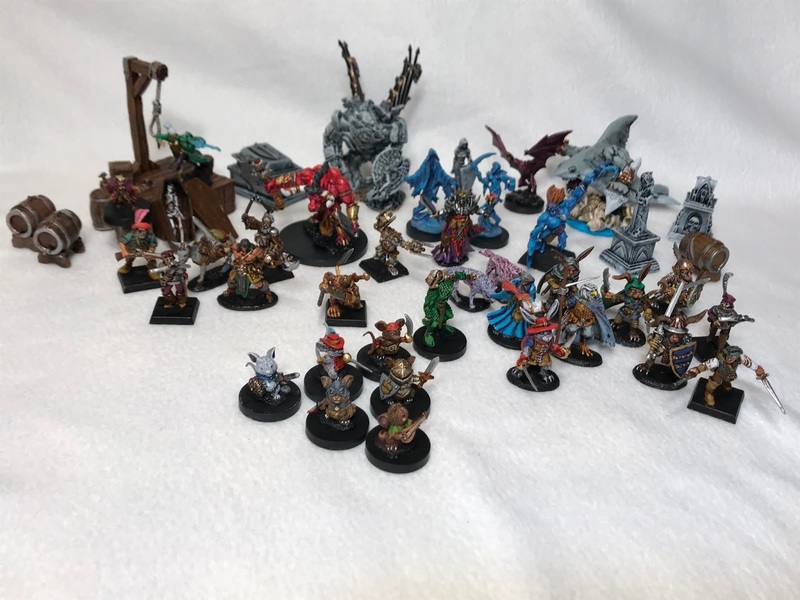 For the record, as of today I've finished 32 miniatures. BOO YAH! Just a light painting day today for #30Days30Miniatures. I had a Road Crew event for Dungeon Crawl Classics at the Games Keep in West Chester, PA, and needed some time to prep for my event. So after making breakfast this morning, I sat down with the intention of just wrapping up a single miniature. Since my Reaper Mouseling Pirate was so close to completion, that's the direction I went with. Just needed to do a bit of dry brushing and then detailing of his features. Unfortunately his peg leg seems so low to the ground that I didn't want to detail any of it. I may go in there at some point with a different brush and make it more obvious later. But for now, this is what I got! Behold Thoraxis! Mightiest of barbarian warriors! Greatest swordsman who has ever set foot in the city of Felstad, bravest pirate who has ever sailed the Ghost Archipelago, and finest hero of Tristram. When I saw this Reaper Bones miniature at Phantom Games last week, I just had to have it. For a couple years now I've been playing Diablo 3 on Xbox with my three kiddos. My character is Thoraxis the Barbarian. This miniature may not look quite like the one in the video game, but close enough. So much fun to paint! The gallows is also a Reaper Bones piece of terrain. Super easy to paint, and just a great piece for the table. Overall a very successful painting experience this morning. I hope yours has been as well! After last night's rather somber #30Days30Miniatures post, tonight I decided to just stick to a simple Reaper Bones donkey. No joke... I painted a donkey. 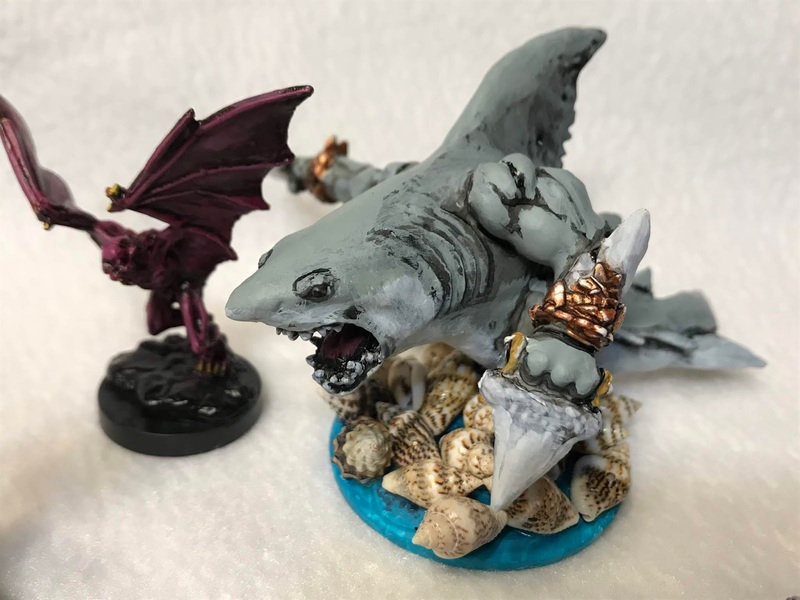 Not the most exciting miniatures I've ever painted, but I figure that he'd have his use at the table. I really like all the gear he has on his back too! That's a lot of swag for a cute little guy to be carrying around. Aside from the donkey, I also did a bit of work on my Reaper Bones barbarian and gallows. I almost did something with my Reaper mouseling pirate, but decided to hold off. Dinner was ready.